This is a dry, lighter-coloured, serious Rosé, best enjoyed with food. Smooth and rounded, it has raspberry, almond and red appleskin aromas and a warm finish. New method adopted in 2015. Made of 85% from Rhône grape Cinsault and 15% Mourvedre from vines planted since 2000 at around 1,000m above sea level in the Bekaa Valley. 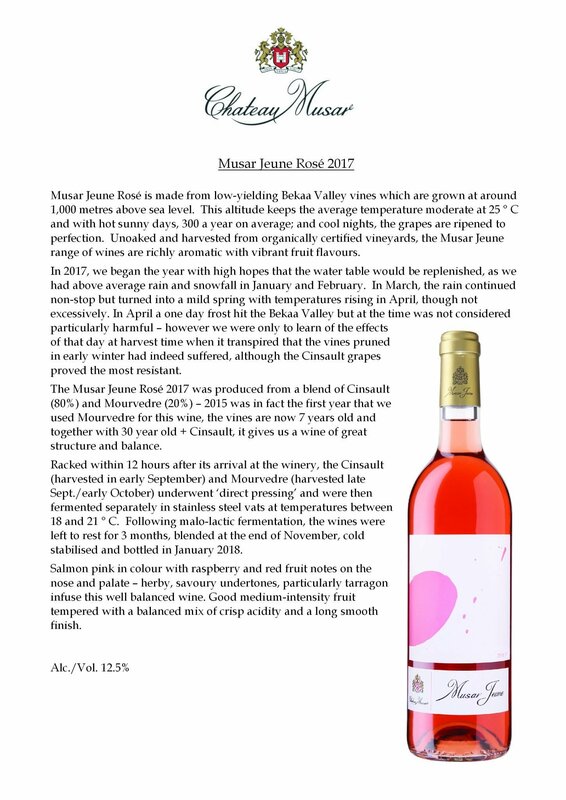 Musar Jeune Rosé is made of ‘saignée’ (‘bled’) method and pressing method using pink juice removed from Cinsault and mourvedre grape must, fermented in cement-lined vats and released unoaked a year after the harvest. No need to decant; enjoy chilled (12°C) with baked salmon, shellfish, roast pork or tomato-based pasta dishes.